The vast social upheaval caused by the Russian Revolution (see my history primer here) also led to an explosion of art. With a large illiterate population, the Soviet Union’s leaders recognized the power of visual art to encourage acceptance of the country’s new system. Newfound feelings of freedom and fears of outside enemies lent an urgency to the artwork. 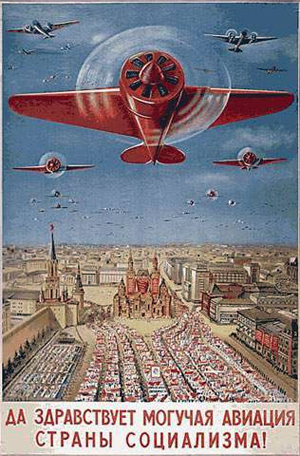 New techniques and styles were embraced, and posters usually involved a call to action to help build and defend Soviet society. Many posters were produced by government news agencies such as ROSTA or TASS. They were called “windows” due to their display in the windows of news offices and stores all over the country. The devastating Nazi invasion of the Soviet Union in 1941 led quickly to a total mobilization of the nation. Not only soldiers were needed. Factories had to be staffed. Farmers needed to harvest food. But the Soviets included more than just military and logistical mobilization. Writers and artists were part of the total mobilization. This was an ideological fight, against an enemy intending to wipe them out. Art needed to encourage people to carry on the fight against a seemingly invincible foe. It also needed to inspire people who might have harboured lingering resentments over abuses they suffered from the Soviet system. 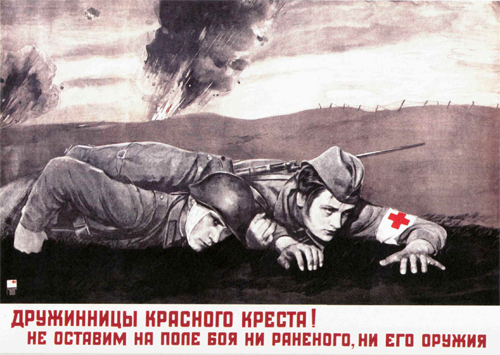 Perhaps the most famous Soviet poster from the war was also one of the first. In July 1941, the Germans stormed toward Moscow. For the Soviets, already suffering hundreds of thousands of casualties, it was a desperate situation. Stalin was keenly aware of public sentiment and involved himself directly in the production of propaganda posters. On seeing Motherland is calling! he reportedly ordered thousands to be produced right away. He understood that it struck a nerve with the ordinary soldier, who was alternately shamed and inspired by this mother figure to fight the enemy. She holds the military oath on her hands. The poster proved so popular, soldiers kept copies with them and carried them with pride as they advanced and retreated. TASS became a prolific producer of propaganda art and employed a great number of artists. A new poster was produced each day of the war. In Moscow, people flocked to the windows of the TASS office on Kuznetsky Most to see what they posted each day. TASS “windows” covered a wide variety of subjects and styles, and included almost whimsical elements, such as an alphabet of war terminology. The poster for K depicts the order to stab with a bayonet! Of course, propaganda posters didn’t just exhort people to join the army or support the troops. They could demonize the enemy. They could call for revenge against their Nazi atrocities. Sadly there was ample material drawn from real life for these posters. The working woman was a concept familiar to Soviet culture since the revolution. Posters celebrating women’s role in the factories feeding the war effort would have hardly looked out of place before the war. What was new about the depiction of women in propaganda art was the increased recognition of their role in combat. Posters showing women in battle helped to drive home the reality for the Soviet people: this was a total war. Everyone would play their part. Women. Children. Soldier. Worker. Artist. Sparrow Squadron Strike the Enemy! Propaganda is an ever-present fact of life for the characters of Sparrow Squadron. The pilots keenly listen to news updates filtered through their political commissars. They grimly absorb stories of enemy atrocities. And their own exploits wind up as grist for the propaganda mill, whether they like it or not. 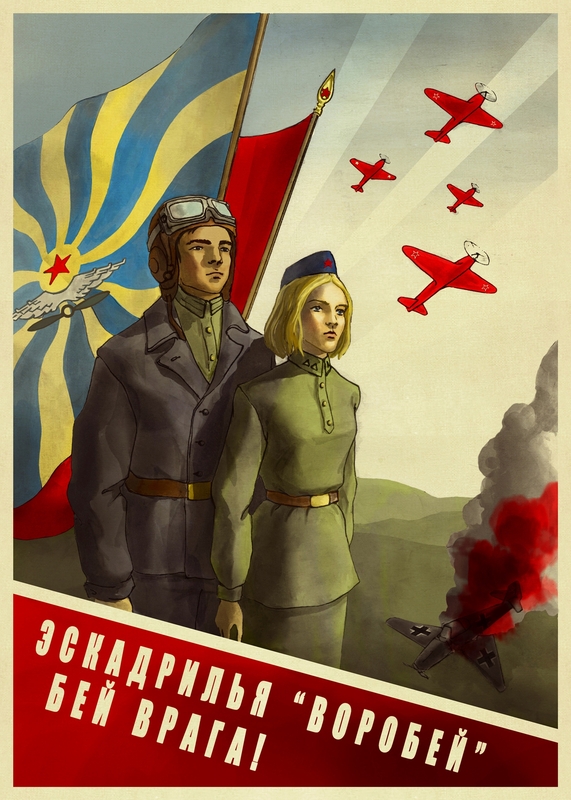 Artist Daria Tikhomolova produced this promotional art for the novel, drawing inspiration from the propaganda posters of the era. Men and women fought side by side for the Soviet Union. The main character, Aelya, stands with Mark, call-sign Stitches, in front of the flags of the Air Force and the Soviet Union. Stylized red Soviet fighters fly past in celebration over the wreck of a German fighter. The title, “Sparrow” Squadron Strike the Enemy! is a bit of Russian wordplay. You can see more of Daria’s beautiful art for the novel on the artwork page.